What are you going to prepare for Easter? A nice table, children running for eggs, Swiss rabbits and French hens in the garden, Easter here we are! I have cooked these delicious braised lamb shank that will melt in your mouth. My first real Easter with my daughter! I so want to see her look around to find some chocolate candies. For this recipe, I went back to Manor. I enjoy to do my grocery shopping there when I get the chance. 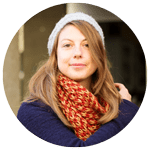 I love their fish and butcher shops, a lot of choices, fresh products… Everything is so tidy, ordered with pretty colors that I do not really feel like to do shopping but rather to make me happy . 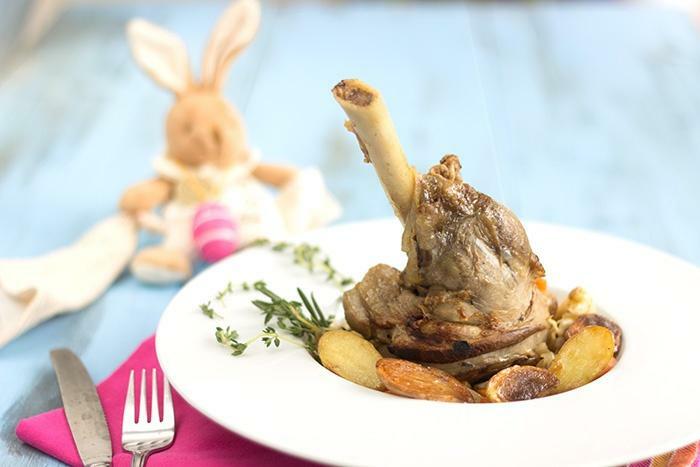 At Easter in general, lamb is served. So I asked their butcher how to prepare these delicious lamb shank and I must tell you that I was largely inspired by his recipe! 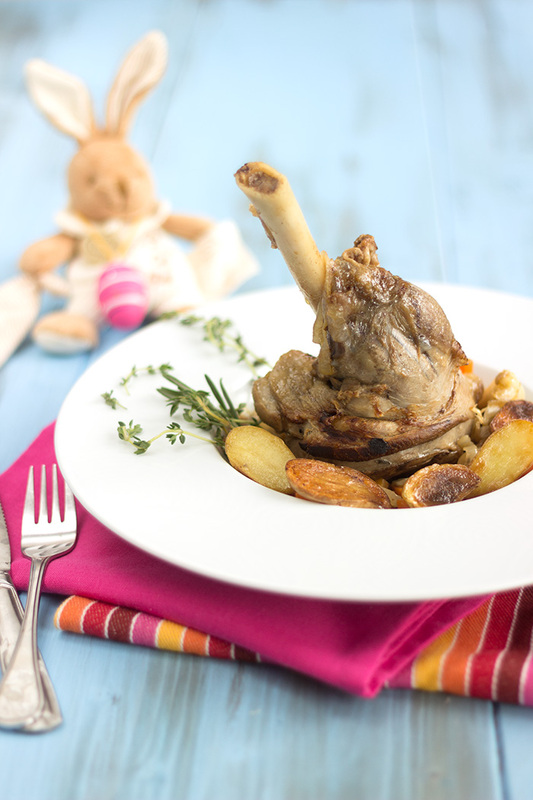 Preheat your oven to 120 ° C.
Brown the lamb shank in a cast iron casserole with a good drizzle of olive oil on all sides. Meanwhile, prepare the vegetables. Peel the onions, slice them. Detach the cloves from the garlic heads and crush them lightly with the flat of a knife. Peel the carrots and cut them half round. Deglaze the meat with the white wine. Remove the meat from the dish, rub the bottom of the pan well with a wooden spatula to recover all the juices. Pour the juice into a bowl, add a few turns of pepper and half a teaspoon of coarse salt. Fry the vegetables in a good drizzle of olive oil until the onions lightly color. Add meat, gravy, thyme and rosemary, cover and put in the oven for 3 hours. Monitor the cooking regularly and add a little water if necessary.